I'm spending my Saturday night organizing my stash.....or part of it. 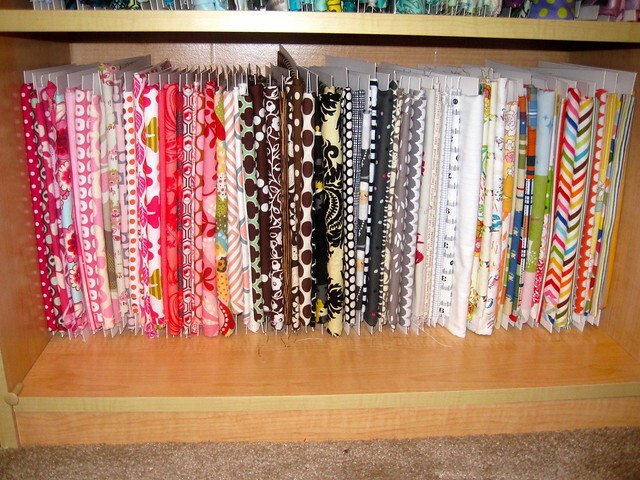 This shelf represents maybe 65% of my fabric......or maybe 50%. :) I finally ordered those comic book boards from Amazon and set to work wrapping up all my fabric. I decided to do this because my fabric would no longer fit folded on the shelf. It looked like my cabinets threw up because it kept spilling out all over the floor! Now I have nice, neat little rows! My own private fabric shop! Red through green. I really need some more in here. I'm sadly lacking in red and orange especially. I have WAY too much teal. That's the problem with favorite colors! I need more "real" blues. Pinks through multi. I wish I had more white/cream/gray background fabrics. Mendocino, AMH flannel, AMH voile, AMH Innocent Crush full set, Outfoxed, Castle Peeps, 1001 Peeps, FFA I, Nani Iro, etc. 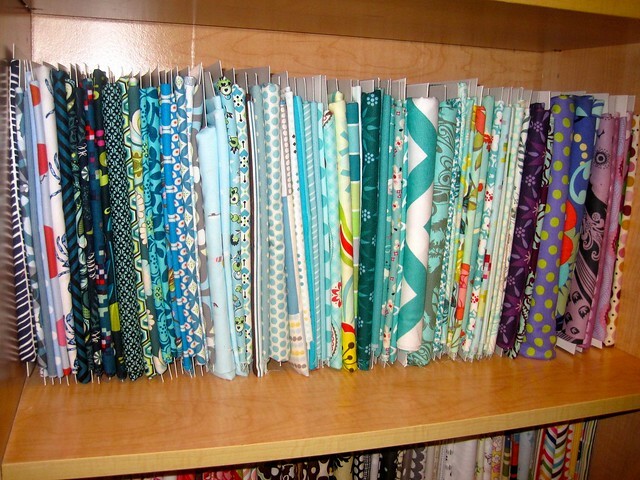 What's not pictured is all my linen blends like Echino, Ruby Star, Heather Ross; solids, fat quarters (they have their own tower), Heather Ross/Munki collection, and my pre-cut collection which is substantial. I finished my Dessert of the Month stitching! I'm thinking of getting a different color cloth and redoing it though. I feel the natural linen color is too light. I also finished quilting the baby Echo quilt! I still have to tackle big Mama, but I'm not sure if I want to buy fabric for the back or use something I have. I was very happy with how the organic wavy quilting came out! I'm so so so sorry I forgot to announce a winner for the hoop bag pattern giveaway! I totally forgot! Mr. RNG picked # 22, Karen P.! Karen, I'll email you the pattern soon! 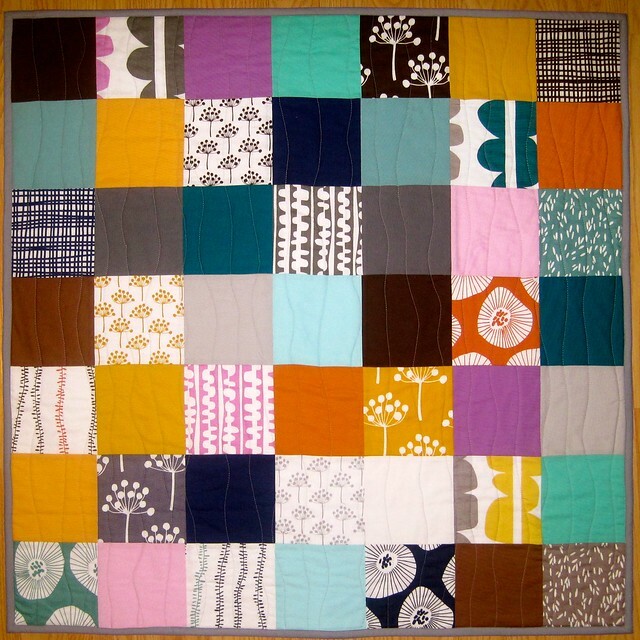 what technique did you use for the quilting? Just pretend you are straight line quilting with a little rhythm with a free motion foot? 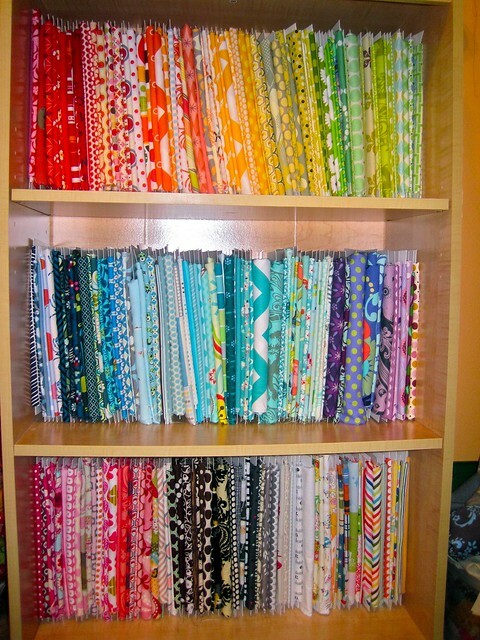 Your fabric shelves look so neat now. I went ahead and ordered some of the comic book boards recently. They came in the other day but I haven't had time to try them out yet. It will be nice to actually see the fabric I have and also to be able to grab some without piles of fabric falling to the floor. I think it will also be a good way to see what colors are needed (like you did) so I can have a plan when I go fabric shopping. Love the quilting on Baby Echo. I like to quilt small quilts like that. Oh your fabric stash is fabulous. Wish I could shop your stash as we have very similar taste! 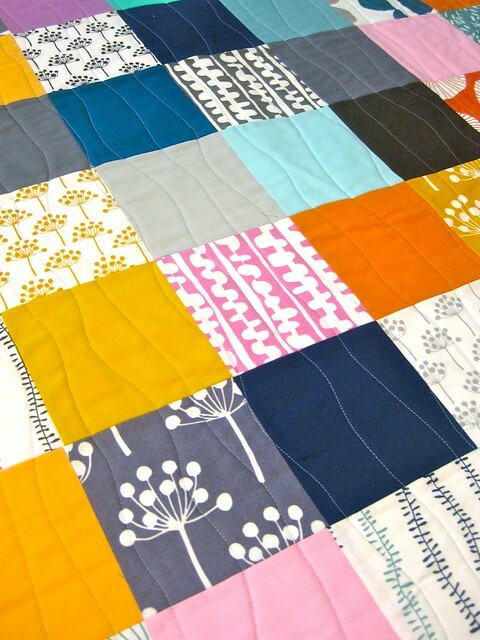 Love the baby quilt and the wavy lines. 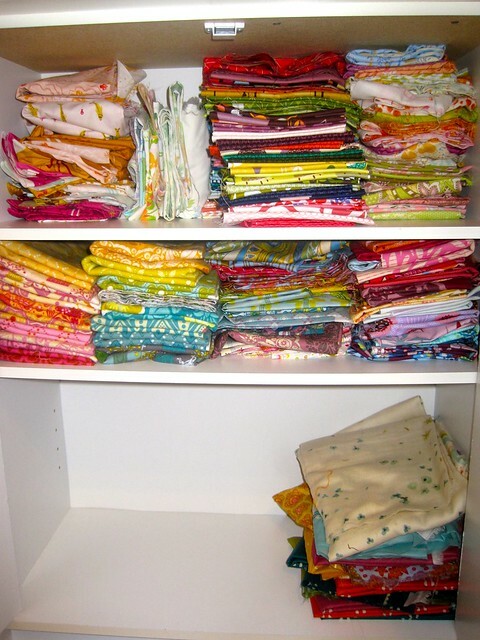 I love seeing all your fabric - I am in envy of it! And it's so pretty all organized. Good job on the finish, looks lovely. Mama quilt will look lovely finished also, I'm sure. Great organization! And looove your echo! Good job on the organic quilting - looks nice! Wow!! Your fabric looks amazing!!! where did you get those boards...and there is not nearly enough purple in there...That is my favorite color. Such a pretty little personal quilt shop you have. The colors just sing! 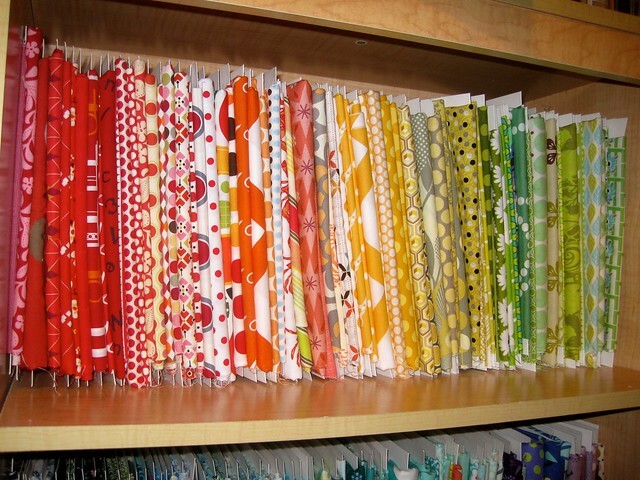 Are you able to cover these fabrics - perhaps shut closet doors over them - so they don't get light and collect dust? Just wondering as we plan to move across country where my sewing room will be an 11' x 13' bedroom (not shared with a bed.) I'm very anxious about downsizing from my current 14' X 28' unfinished basement sewing room. Ack! Oh, yeah!! thank you so much for the hoop bag pattern!! Just what I needed! I shall put it on my "to sew" list!! I have been seriously debating getting the boards, too. Everyone swears by them! Your stash is luscious. And the baby Echo quilt is lovely! Nice job! Love it - clean, neat, and pretty to boot!